Bigger biceps attracts you,Either you are male or female but when you see Bigger Guns, you only say wow!! because The biceps tend to be a highly noticed muscle group by others, actuality the triceps muscle comprises a very large component of the arm, that's why your triceps are very important to work on.We will cover triceps workout very soon, but now it's Biceps day , you can do bicep exercise along with your wings too, as biceps are secondary muscle in wings/back workout. Remember that workout is only 40 percent of your muscles, it's your diet (rest 60 percent), that plays an important role in gaining mass. The only joint that should have any motion is your elbow, stationary shoulder and back as well. Stand up straight and grab the barbell with your palms facing up shoulder-width apart. Curl the weights forward while contracting the biceps as you breathe out and Continue until your biceps are fully contracted and hold for 1 sec, now slowly bring it back to the starting position in the same motion. All you need is a regular preacher bench, and grab an EZ Curl bar with both hands using an underhand grip while palms facing upwards. Curl the weights forward while contracting the biceps as you breathe out and Continue until your biceps are fully contracted and hold for 1 sec (Squeeze the biceps hard and hold this position for a second. ), now slowly bring it back to the starting position in the same motion. Note: Preacher curl can be performed with simple bar and it can also be performed with dumbbells and all of preacher curl exercises are very beneficial for your biceps to grow big. 3) Incline Dumbbell Curls: This exercise is one of the best to help prevent that momentum issue (movement of the back).It maximizes the tension on the biceps muscle belly, so don't be surprised if the weight is slightly lower.Start with lower weight to get the correct movement for the muscle group, and if you are getting good than increase the weight. Sit back on an incline bench, With arms hanging down straight, positioning dumbbells with palms facing inward. While holding the upper arm stationary, curl the right weight forward while contracting the biceps as you breathe out and Squeeze the biceps hard any slowly breath in and bring back your dumbbell to starting position. Now repeat the movement with other hand and make instructed repetition. 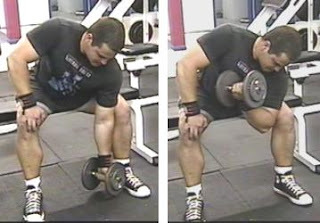 4) Hammer Curls: The hammer curl is a great exercise for the biceps and forearms, this exercise has so many variations like you can perform the exercise sitting down on a bench with or without back support and you can also perform it by alternating arms and change it's movement to inner side by curling it upward near the center chest line. 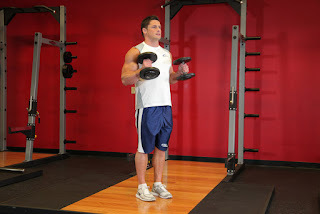 Hold the dumbbells and standing straight up with the dumbbells by your sides like your palms are facing your body. Keeping your body fixed and elbows in at your sides, slowly curl the dumbbells up as far as possible to squeeze the biceps and hold on that position for a sec and bring back dumbbell to the starting position. 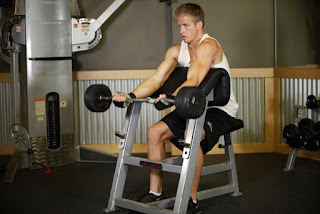 5) Concentration Curls: Dumbbell concentration curls is a great isolation exercise that mainly targets the biceps, This movement is very effective for developing the overall head and the ball of the biceps muscle. Sit on the end of a flat bench or on a lower flat chair with your legs apart,with one dumbbell in front of you and between your legs, palms facing your face. Use your right arm to pick the dumbbell up. Place the back of your right upper arm on the top of your inner right thigh and make the moment slower as to maintain load on the peak bicep and twist your palms a little outward, now hold for a sec. and now bring back your dumbbell to starting position. Ask your trainer to correct the movement if your biceps are not getting loaded or if you have any problem with any movement. So choose wisely and Stay Fit, Stay Healthy.If You Like My Article Please Don't Forget to share it and Comment Below. For example, push-ups strengthen the arms while squats make the legs stronger. A strong center takes care of the periphery too. Even BLNCK corp. and https://www.supplements.co.nz confirmed it! Reference - Paul, Benjamin. “RoidX Juice Scientific Studies.” HGHOfficial.Com, i.e. 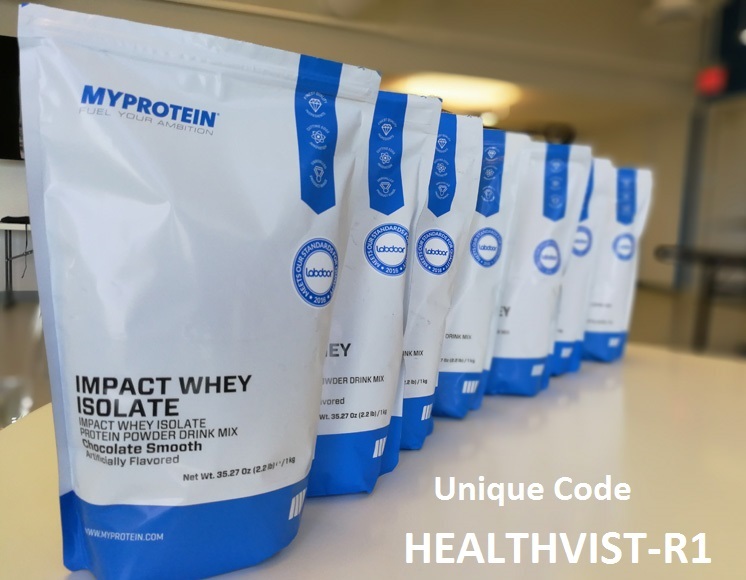 HGH Official, https://hghofficial.com/roidx-juice/. Accessed 15 Feb, 2019.